Swing Wing Sign Holder has clear acrylic pocket and stylish silver-anodized aluminum base. 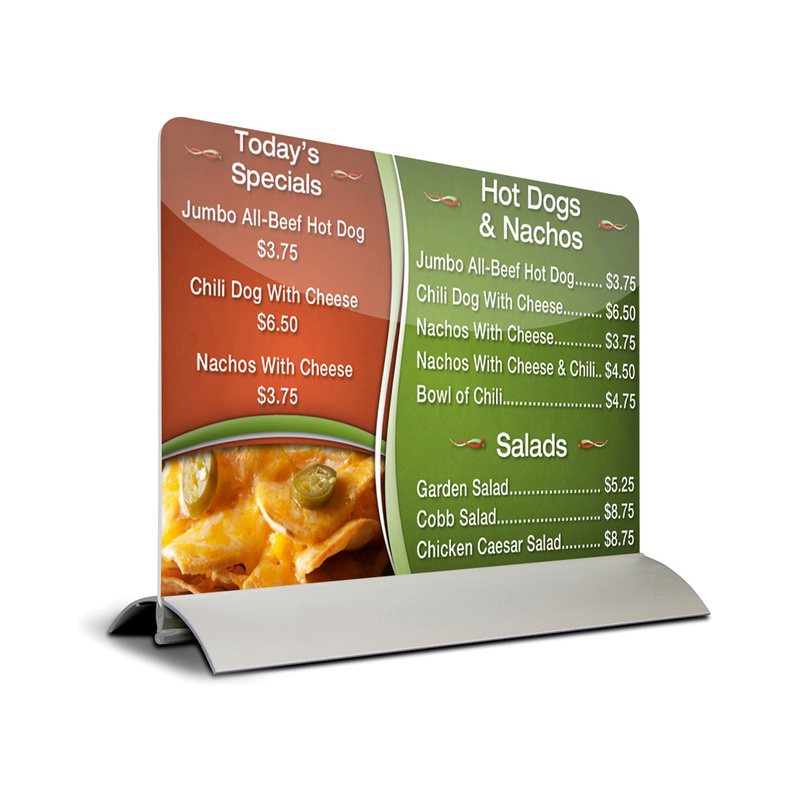 Ideal for restaurant and hotels for display of menus. The aluminum base is suitable for logo printing. Max letter height in printing is 1 5/8 inch (40 mm). Several poster materials can be used with this base; PVC Foam, PS, PET. The thickness varies between 1/16 - 3/16 inch (1-4 mm). We have unified good quality with low cost by thinking that you will be pleased so we present you one of our best products. For displaying pictures or any other advertisements, the menu card holder is the one which is designed perfectly for meeting your requirements. Especially in today’s world, as a notion, time is so important that’s why we give importance to the shipment of our products in time . Another point which shows the modernity of these acrylic display stands is the ability of cleaning them easily. So, with a piece of wet cloth or a sponge you can wipe down it in a few seconds! If you buy this menu card holder you will become the true winner as you will be paying low, receiving it in short time, saving time during cleaning it and attracting the costumer’s attention thanks to its elegant design!. Usage of these acrylic pamphlet holders or as also known acrylic display holders is very common especially in the service industry such as in restaurants, cafes or at retail stores. These acrylic pamphlet holders stand can be placed in many diversified places because of its signature aluminum stand which can be also placed as an acrylic display holder which is seen at bars. As these acrylic sign frames are suitable for 4"w x 6"h graphics, they can be located vertically according to your preference. Additionally, it has 3/16" thick acrylic picture frame with an edge which is polished. Thanks to the aluminum base that these acrylic sign frames are very durable which means that you can transform yourself into an advantageous side. Our acrylic display holder which is also known as a brochure rack for a cafe is also resistant to scratches. Beyond being durable and resistant, it is also contemporary and modern so you can find all these positive criterions in just one product! In addition to these points, by getting base of keeping your costumers’ eyes on your product , we have designed our brochure racks as remarkable ones. That’s why, your sale and profit proportions will increase so we can say that either in the short or long time, it’s absolute that you will make good profits by just buying one of them. However, despite all these positive topics, as we have said before its cost is little that’s why you can not believe that by such a low cost you can have such a good brochure rack. With this picture display you can advertise your services, products or firms easily which means that changing and updating the posters is simple by just taking your few minutes. Especially in restaurants and cafes, you can announce the most actual changes in a very short time so buy our acrylic pamphlet holder at once! 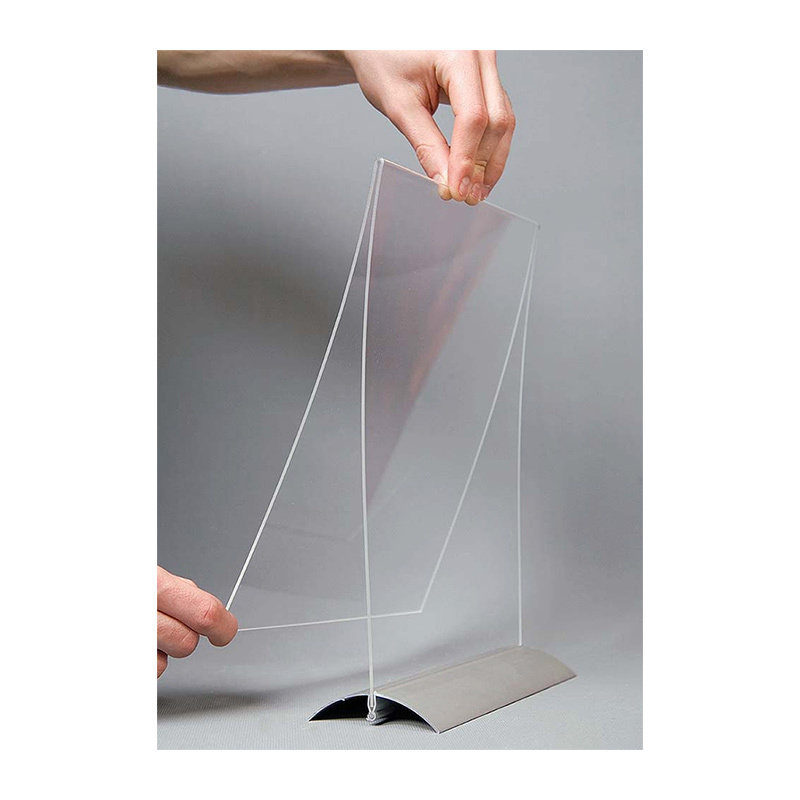 Through this acrylic display holder, you can influence not only your costumers or clients but also your guests at home. So enjoy the praises of them about how much you are elegant in designing around! So put one of these picture frames at home!